British Regimental ties. Army, Navy and Air force patterns. Good quality military ties for past and present Regiments and Corps. With over forty years worth of military experience here in the office, we feel that we have the expertise to answer most questions. So if you wish to enquire about any particular tie please do not hesitate to contact us. Meanwhile, we will be adding many more to this list over the coming weeks. Coming soon! Regimental Bow Ties and Cravats. An RAF regimental tie made from good quality polyester and manufactured in the UK. 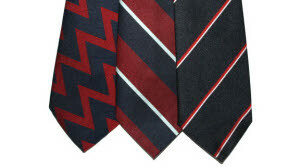 A Grenadier Guards regimental motif tie made from good quality polyester and manufactured in the UK. A Royal Military Police regimental tie made from good quality polyester and manufactured in the UK. A Royal Army Ordnance Corps tie (old pattern) made from good quality polyester and manufactured in the UK. A Brigade of Guards Regimental tie made from good quality polyester and manufactured in the UK. A Royal Corps of Signals Regimental tie made from good quality polyester and manufactured in the UK. A Royal Engineers Regimental tie made from good quality polyester and manufactured in the UK. A Household Division Regimental tie made from good quality polyester and manufactured in the UK.